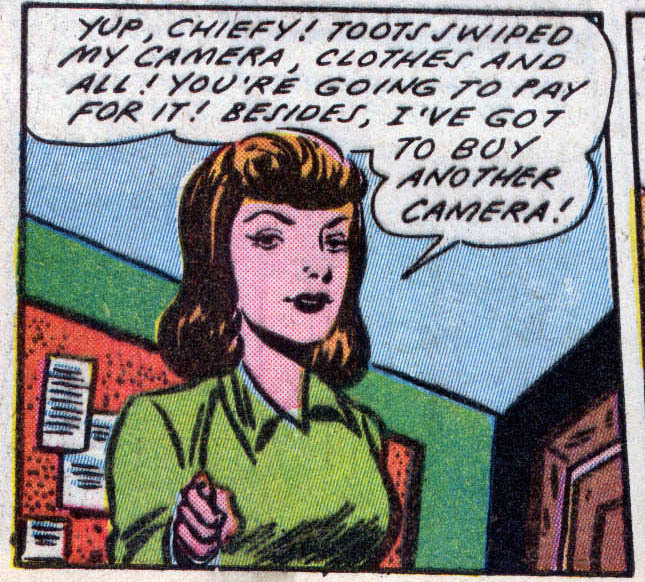 The comic book sub-genre of "Daring Girl Reporter" has always struck me as one of the medium's simultaneously most endearing and most patronizing branches, if not an overly popular one. Largely, it's part and parcel of an entire catalog of female professionals whose names were invariably preceded by "Girl" ... girl police officer, girl detective, girl inventor, girls who are boys who like boys to be girls, girl you really got me going, all the major girls. Your top girls, all gainfully employed and smashing Nazis in the mush. Most popular genre on PornHub. Gail Porter was the house newshen* and shutterbug of the Daily Chronicle (and, later, Daily Star), whose camera led the way for her adventures. This covers everything from smashing criminal rings, to foiling suicide attempts, to unmasking a crazy werewolf and also getting knocked unconscious in prison and dressed in a convict's clothes. They prepare you for things like that in journalism school, or they used to before budget cuts replaced every American journalism program with a lottery ticket and a misunderstanding of George Orwell. She literally makes her own headlines. A young Bob Oksner provides the art for the series and, even at a rough stage early in his career, there's something very entertaining about the line and shapes. It's the dialogue, hard-boiled and wry in turns, that really sells the bit. A staple of the genuinely excellent Blue Circle Comics family, Gail's camera may have exposed scams, crooks and crimes, but the strip was mostly built around her bite. The roving reporter angle gets her into a variety of different situations -- from phony hauntings to Nazi subterfuge -- in search of sensational photographs, which keeps the action going strong, and gives Gail something new to do from story to story. Nothing feels like a repeat in her admittedly brief six-issue career, except for her outfit; the same tomato-soup-red dress and dinner plate hat appear in every tale. It's a huge hat. 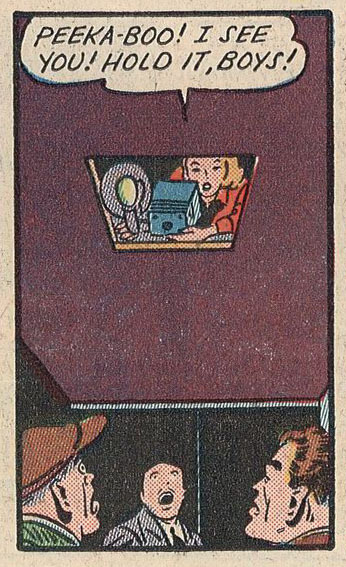 It's basically a portable dark room. And it makes her look like an inverted exclamation mark. I dunno, I like it. 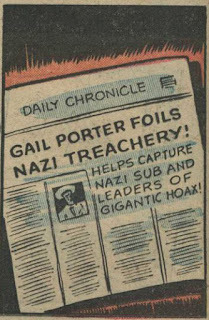 Back in the Forties, there ran -- very briefly -- a Lois Lane comic strip, published alongside the Superman sunday newspaper strips. 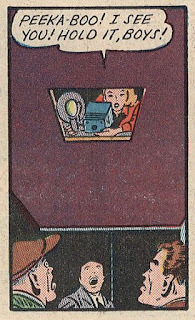 Primarily, it was a gag strip, with the world's best known Daring Girl Reporter primarily getting stuck in slightly humiliating situations, or finding herself in over her head. Gail Porter, Girl Photographer, is exactly what a Lois Lane comic strip should have looked like, at the time. 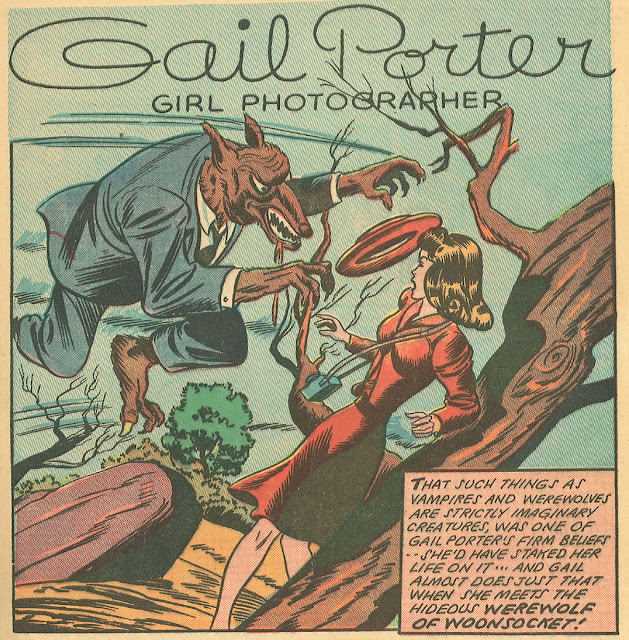 Tough talking dame takes no guff, wears awesome hat, occasionally slugs fake werewolves.